The Dow enjoyed its best advance in nearly a month on Jul 9, gaining triple digits to close in the black for the third consecutive session. The blue-chip index heralded a broader rally for U.S. stocks. Notable gainers for the day were financials and industrials, sectors that have been dragged down by trade tensions. But it now seems that investors are willing to ignore such concerns following the release of bullish economic data. Wall Street is also waiting expectantly for what will likely be another strong earnings season. Given these factors it makes sense to pick select Dow stocks as markets choose to focus on broader fundamentals. Bank shares were the primary catalysts to Monday’s gains. Shares of JPMorgan Chase (NYSE:JPM), Bank of America (NYSE:BAC), Citigroup (NYSE:C) and Goldman Sachs (NYSE:GS) gained 3.1%, 3.6%, 2.7% and 2.8%, respectively. JP Morgan, Goldman Sachs and Caterpillar (NYSE:CAT), which gained 4.1%, were the biggest gainers for the Dow. As a result, the Financial Select Sector SPDR (XLF) gained 2.3%. Among other notable gainers were industrials with the Industrial Select Sector SPDR (XLI) gaining 1.9%. Shares of Boeing (NYSE:BA) gained 2.2%. Monday’s gains helped the Dow enter the positive territory for 2018. The index is now up 0.2% year to date. The United States’ imposition of tariffs on $34 billion of Chinese imports and Beijing’s retaliation have raised trade tensions recently. But analysts feel that the possibility of a trade war in the short term has declined. This is evident from the resurgence of financials and industrials, sectors which had been hurt by trade worries. Instead, investors are choosing to focus on economic data, which has come in exceptionally strong recently. In May, consumer borrowing increased substantially, per data from the Federal Reserve. Total consumer credit increased $24.6 billion to a seasonally adjusted level of $3.9 trillion. This represents an annual pace of 7.6%, the sharpest since November. Further, the economy added 213,000 jobs in June, while job additions for April and May were revised upward by a combined 37,000. Investors are also looking forward to the second-quarter earnings season. The strong possibility of another bullish performance is another likely driver of market gains. Total Q2 earnings are expected to be up 19% from the same period last year on 8.2% higher revenues, with double-digit earnings growth for 11 of the 16 Zacks sectors. This would follow 24.6% earnings growth in Q1 on 8.7% revenue growth, the highest growth in almost seven years. The resurgence of financials and industrials indicates that markets are choosing to ignore trade tensions. Instead, they are choosing to focus on strong economic fundamentals. The fact that the second-quarter earnings season is about to commence is another catalyst in itself to market gains. Investors have strong expectations from this set of results as well. Investing in select Dow stocks, which make up the broadest market barometer for U.S. stocks, looks like a smart option at this point. However, picking winning stocks may be difficult. Chevron Corporation (NYSE:CVX) rose almost 2% after the U.S. energy giant reported stronger-than-expected first-quarter earnings on Apr 27 amid a recovery in oil prices and production gains. Zacks Rank #1 (Strong Buy) Chevron has a VGM Score of A. The company’s expected earnings growth for the current year is more than 100%. The Zacks Consensus Estimate for the current year has improved by 9.8% over the last 30 days. Boeing reported adjusted earnings of $3.64 per share for first-quarter 2018 on Apr 25, beating the Zacks Consensus Estimate of $2.59 by 40.5%. Boeing has a Zacks Rank #1 and VGM Score of A. The company has expected earnings growth of 21.8% for the current year. The Zacks Consensus Estimate for the current year has improved by 0.9% over the last 60 days. Intel (NASDAQ:INTC) delivered first-quarter 2018 non-GAAP earnings of 87 cents per share on Apr 26, which beat the Zacks Consensus Estimate by 16 cents. The figure surged 31.8% from the year-ago quarter but declined 19.4% sequentially. Intel has a VGM Score of B. The company has expected earnings growth of 15.6% for the current year. The Zacks Consensus Estimate for the current year has improved by 4.2% over the last 30 days. The stock sports a Zacks Rank #1. Walt Disney (NYSE:DIS) delivered second-quarter fiscal 2018 adjusted earnings of $1.84 on May 8 that beat the Zacks Consensus Estimate by 16 cents and surged 23% from the year-ago quarter. Disney has a Zacks Rank #2 and VGM Score of A. The company has expected earnings growth of 24.9% for the current year. The Zacks Consensus Estimate for the current year has improved by 0.6% over the last 30 days. 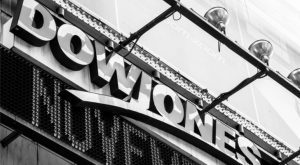 Article printed from InvestorPlace Media, https://investorplace.com/2018/07/4-dow-stocks-buy-markets-ignore-trade-tensions-ggsyn/.